Pic the Gift is launching new superhero capes that can be customized to save any gift giving headache. It is a great gift to give any child to spark their imagination during play time or those who love to pretend to be their favorite superhero saving the day. Pic the Gift is now customizing and personalizing new superhero capes to create one-of-a-kind superheros. It is a great gift to give any child to spark their imagination during play time or those who love to pretend to be their favorite superhero saving the day. The cape is made from poplin, a strong fabric, and measures to about 35 inches long. It will fit most children from ages 3 and up. The cape uses a Velcro closure for an easy use and quick release. Use the online designer provided by Pic the Gift to invent the next superhero. Upload pictures from Facebook or Instagram, upload personal files, or use the massive library from Pic the Gift’s stock clip art. The cape can be either personalized or have some text embroidered. When designing, mind if placing any text that it is centered from the neck hole to the bottom and keep images away from the sides to avoid being lost during production. Create a creative superhero cape to provide a child with hours of imaginative play and empower them to build their self esteem, develop self confidence. 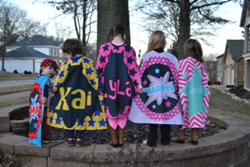 Let them become their own superhero to the save the day by purchasing them a new personalized superhero cape. At Pic the Gift they strive to “WOW” their customers for 50 years by creating quality products right here in the USA. Pic the Gift offers personalizing one gift for the special person or to fill a wholesale of personalized gifts. Pic the Gift is green and offers free shipping on all orders. Check out Pic the Gift’s full line of products at http://www.picthegift.com/.